This summer has been a glorious mix of amazing weather, trips to the farmers market, and travels to new cities. 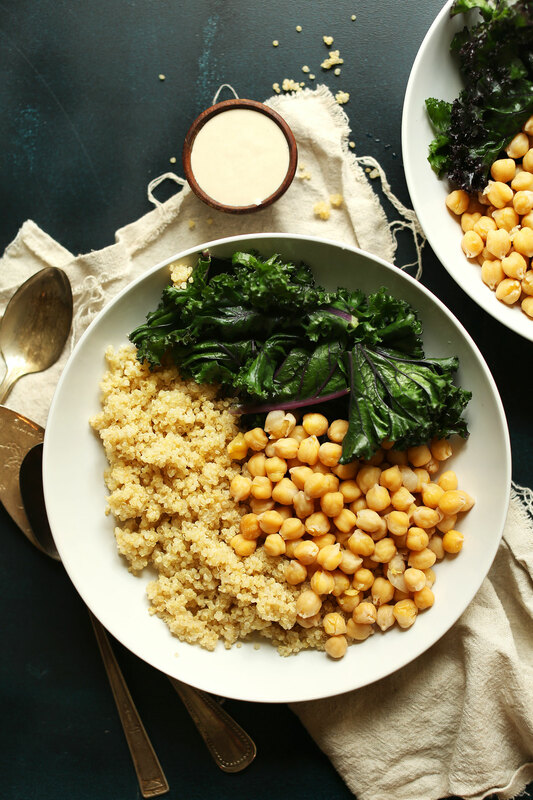 Since summer is on its way out (booo) I thought it appropriate to highlight one of my go-to meals recently: This 7-ingredient kale, quinoa, chickpea Buddha Bowl. It may seem simple and just like any other wholesome bowl, but the flavors meld together perfectly, it’s a nutrient powerhouse (with 22 g protein per serving), and its simplicity is the best part (anyone can make it)! Interested in how this delicious bowl is made? Please follow me. This recipe is inspired by the Mighty Bowl at Prasad (one of my favorite Portland restaurants) and starts with cooked-from-scratch chickpeas (which are totally easy by the way). My new go-to quick soak method tenderizes the beans and opens them up nicely, saving you (6-8) hours of overnight soaking. Cook immediately after soaking and you have delicious, tender, nutrient-rich beans in roughly 2 hours flat. In the final minutes of the beans cooking, it’s time to prepare your quinoa (a gluten-free, protein powerhouse), make your 3-ingredient Tahini Sauce, and steam your kale (why kale is amazing, in case you aren’t convinced). Then it’s Buddha Bowl building time. This is the perfect meal for most any occasion, but especially when you’re craving a healthy, hearty lunch or dinner. It packs up beautifully for work the next day for lunch. Plus, it’s ideal for serving to a crowd as it’s suitable for pretty much every kind of special diet. Win win! If you try this recipe, let us know what you think! We love seeing your comments, ratings, and especially your photos tagged #minimalistbaker on Instagram. Cheers, friends! 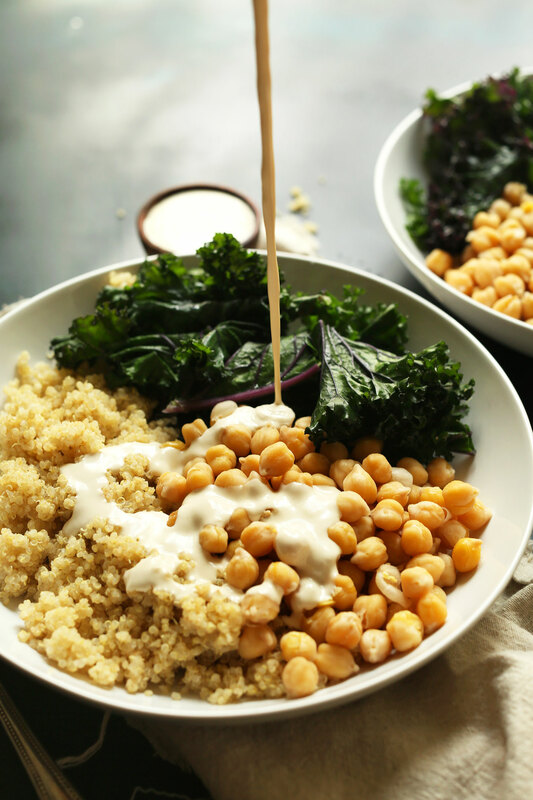 An incredibly satisfying, healthy, nutrient-rich buddha with steamed kale, from-scratch chickpeas, quinoa, and 3-ingredient tahini sauce! Just 7 ingredients required for this delicious plant-based meal. Either soak chickpeas overnight in cool water (for 6-8 hours) or use the quick-soak method: Add rinsed chickpeas to a large pot and cover with 2 inches water. Bring to a boil over high heat and boil for 1 minute. Then turn off heat, cover, and let soak for 1 hour. Then drain, rinse, and add back to pot. To cook soaked chickpeas, add to a large pot and cover with 2 inches water. Bring to a boil over high heat, then reduce heat to a simmer, add salt and stir, and cook uncovered for 40 minutes - 1 hour 20 minutes (depending on the size/freshness of your beans). Sample a bean at the 40-minute mark to see how tender they are. You're looking for a just tender bean with a tiny bit of bite, and the skins will start to show signs of peeling (don't go too mushy!). Once cooked, drain beans and set aside and sprinkle with a bit more salt. In the last 30 minutes of the beans cooking, start your quinoa by heating a medium saucepan over medium heat. Once hot, add oil and rinsed quinoa. Toast for 2-3 minutes, stirring frequently. This will allow some of the water to evaporate and add a nice toasty flavor. Add water and increase heat to medium-high/high to bring to a boil. Once boiling, reduce heat to low (simmer), cover, and cook for 18-22 minutes, or until the quinoa is tender and the water has completely absorbed. Then remove from heat and loosely drape the pot with a towel or paper towel to continue absorbing any excess moisture. Prepare dressing by adding tahini, sea salt and garlic powder to a small mixing bowl and whisking to combine. Then add water a little at a time until it forms a pourable sauce. Lastly, steam kale. Add 1/2 inch water to a medium saucepan and bring to a simmer over medium heat. Insert a steamer basket and the kale and cover. Steam for 1-2 minutes, or until kale is vibrant in color and slightly wilted. Immediately remove the kale from the heat and transfer to a small dish for serving. 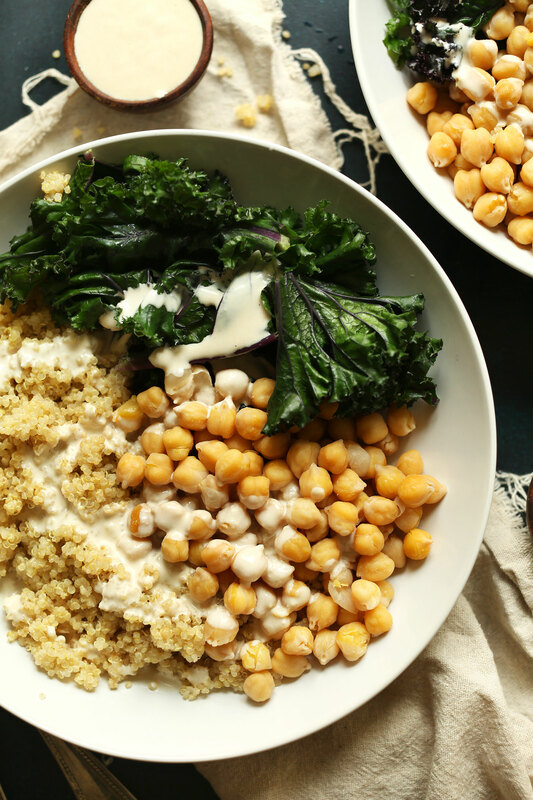 To serve, divide quinoa, chickpeas and kale between serving bowls and top with tahini sauce. Add a splash of fresh lemon juice for more flavor and a bit of acidity (highly recommended). Best when fresh, though leftover sauce, quinoa, and chickpeas can be stored separately in the refrigerator up to 4 days. Kale is best when (steamed) fresh. 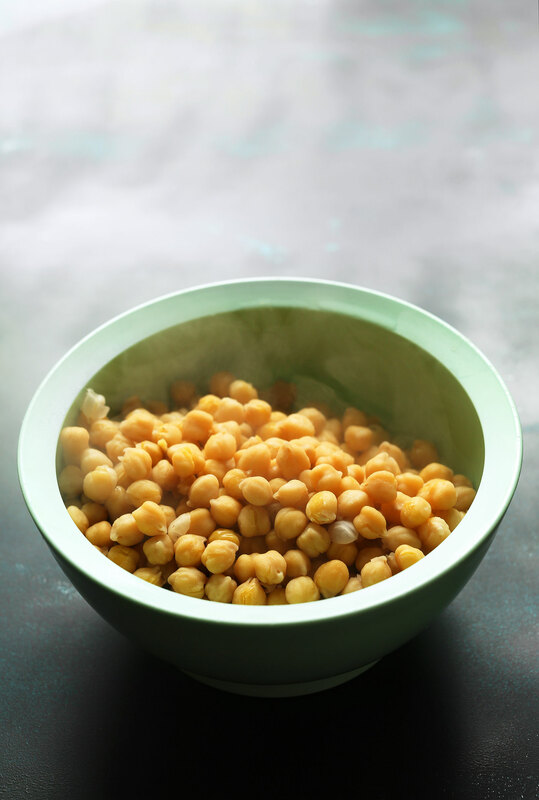 *Quick soak chickpea method by The Kitchn. Chickpea cooking tips from the lovely Tori Avey. *Prep/total time accounts for the quick soak chickpea method. Add 6-8 hours if soaking overnight. *Recipe inspired by the Mighty Bowl at Prasad in Portland, OR. Yay! We hope you love the recipe, Tori! Hi Dana, I was wondering if for these bowls you used the West Elm Basic Bowl or the Low Bowl? This recipe is also amazing. Thanks! Unfortunately sesame gives me migraines (as do cashews)… almonds are ok, though: do you think almond butter might sub in here (with extra water)? Or any other ideas for an alternate sauce? Thanks so much – your recipes look amazing. Hi! Almond butter would work nicely I think! I make this bowl at least once a week. Quick, easy, super nutritious, and so so delicious! Such a simple and cheap but healthy and filling meal. It was even worth having to make the tahini from scratch! My husband are just a few days into our plant-based transition. This recipe was a hit! I used collards as kale is not popular with my husband. I finished the dish with a squeeze of lemon, a drizzle of EVOO and a sprinkle of za’atar. Thank you for making our transition easy and delicious! This looks perfect as I often soak chickpeas and then wonder what will go with them in my pantry/fridge. 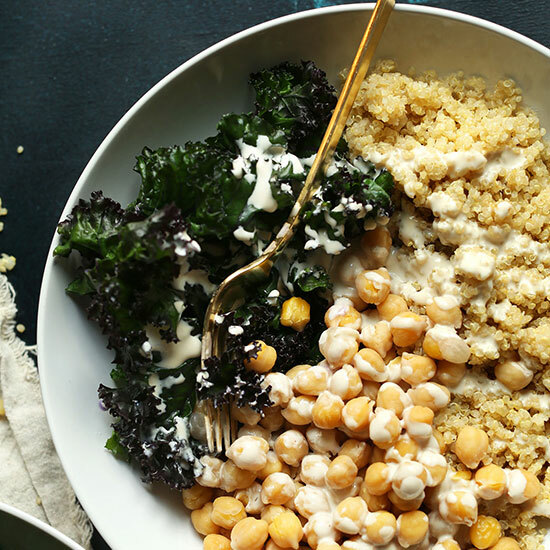 Luckily I nearly always have kale, quinoa and tahini on hand and it comes together so easy. Thanks! I just made it! OMG it was DELICIOUS! Best tahini sauce ever! Used 2 x 19 oz cans of chick peas instead of 1 cup dried. Household favourite. Hi there! I’m wondering which tahini you prefer? Thank you! I love Alexis brand, but Trader Joe’s brand is also good! We have a sesame allergy but that tahini sauce looks perfect. Any idea what I could use other than tahini? Hmm, how about cashew butter? Awesome, quick, lunch or dinner idea! I love the tahini sauce. I had to add a TON of water to get a sauce consistency, but I’m excited to have discovered this meal. I sauteed the kale in some olive oil, earth balance, chopped garlic, s & p, then pushed it aside and added chickpeas to the pan to heat up and served with brown rice which I always have on hand in jars in the fridge and the sauce, of course. 15 minutes from start to finish (I buy chopped garlic). My one year old LOVES the chickpeas with tahini sauce! yay! I’m so glad to have found something besides black beans and sweet potatoes that he’ll eat! The tahini sauce is hard for me to get viscous! Oh no… i think i did something wrong! me too! I added more than a cup of water at least (I stopped measuring). I added a ton of water to get a sauce, but the flavor was still on point and delicious. Oh so fast in the Instant Pot or any other pressure cooker. No soaking for chickpeas. 35 min on hi pressure. Quinoa takes only 2 min. Kale is 1min. Wow….. best meal ever! Great recipe. This is my new favorite go to meal! So easy and SO delicious. I added roasted beets the second time I made it, and it turned out even more heavenly! My tahini sauce is not thin. I even got my mini food processor out to give it a spin. It remains peanut butter. How can I get it into a sauce like texture? Hi Janet, each tahini brand will be slightly different to begin with so if you need to add more water, feel free to do so! As I am learning! Thank you for your input and great recipes. They are very inspiring. Simple and delicious—loved it! My only question is about the tahini sauce. It started out creamy then when I whisked it, it got very, very thick. I added water bit by bit and still, super thick. Any suggestions? Keep adding water until the desired consistency is achieved! Looks great! I think some grilled onions would set this over-the-top delicious! But when don’t grilled onions make things better?! I love how healthy and delicious this looks. Vegetarian protein ftw! I’m so excited to be trying this tonight!! Like some of you, I’ll be using canned chickpeas because it’s what I have in my pantry!! Aside from rinsing and draining them is there anything I should do to prepare them??? Thanks for your help!! I’d heat them up a little if I were you! I’ve been looking for a way to cook/eat my quinoa! Thanks for posting the recipe. Ooh, I love a good vegan bowl! Thanks for this one! I just made this recipe for a few friends and it was a hit! We ended up adding a lot of lemon juice which was great, and also tried out some hot sauce in the tahini sauce and that added a great flavor as well! We love all of your recipes :) Thanks for this! I made this for lunch today and love the combination of flavors. But I have a question on the tahini dressing. I made it twice, using Trader Joe’s tahini. Both times the tahini seized beyond repair as soon as I tried thinning it out. I added dribs and drabs at first, room temperature water, didn’t want to overwhelm the tahini. But as soon as any liquid was introduced it seized. It smelled wonderful but was unusable, so I ended up using another dressing I had on hand. Any suggestions on how I can thin the tahini successfully so I can actually make this dressing? Thank you! I find that when I keep mixing the tahini with small amounts of water, even after it seizes up, it eventually smoothes out! Oooh, just picked up a clamshell of mixed spinach-baby kale but wasn’t sure what I wanted to do with. This sounds awesome. Just gotta pick up some tahini! Yum!! I made this with a couple tweaks…I used canned chickpeas and peeled off the skins (only recommended if you have an extra 25 minutes or so- it’s incredibly tedious!). Instead of kale, I used a lettuce blend from Trader Joe’s called Lemony Greens (I LOVE kale but my husband doesn’t). I’ve been wanting to try soaking my beans! Do they taste different than those that aren’t soaked or sprouted? Definitely give it a try Cassie! I haven’t noticed much of a difference in taste when I soak chickpeas! One of the tastiest and simple things I’ve ever made. I made a big batch and took the bowls to a job site my husband was working at today and shared the bowls with the men there. They we’re all loving it! They ate every single bite and said “oh man, what is that sauce stuff on top, thats good” :) Thank you for your recipes. I have your cookbook and enjoy getting the occasional inspiration in my email inbox as well! Cheers! So mediterranean. That tahini sauce looks heavenly. 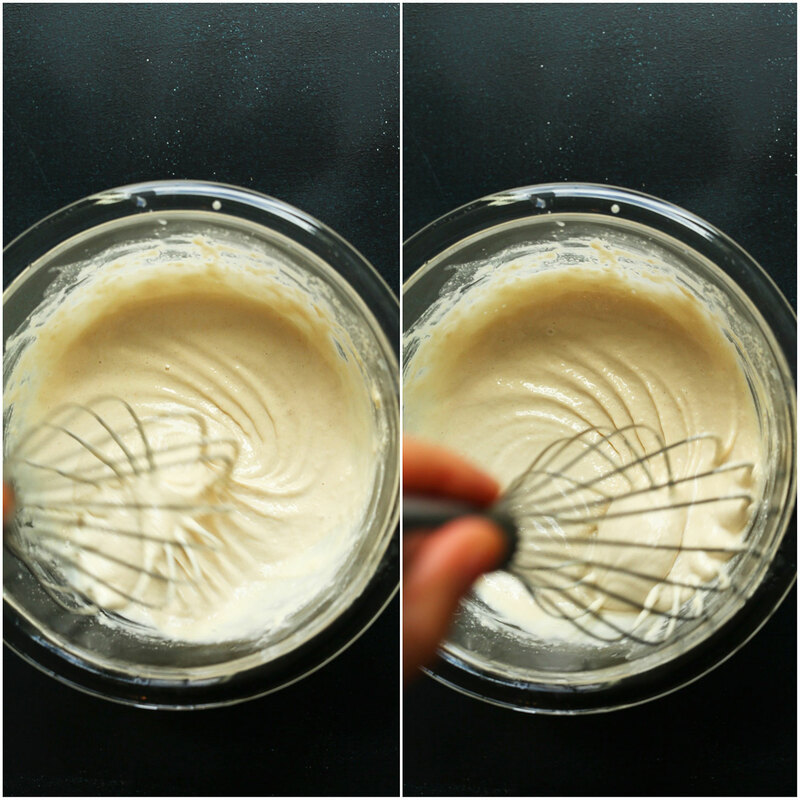 I haven’t made tahini from scratch. Dana, when I was putting this together, I was thinking it was going to be the most boring supper I’d ever had, but I loved it! Just as you said, simple delicious and really healthy. Looking forward to making it again. Right? So good! Thanks for sharing! Looking forward to trying this! We got to visit Prasad and it was amazing. I wish you could come up with a similar dressing to their lemon ginger dressing. I was obsessed with it. Thanks for sharing! Ooh, I’ll have to try it next time! Added to the list! You had me at Tahini Sauce! Seriously that stuff is amazing. I love all your recipes & am getting your cookbook next week. Its easy to cook I would like to try it tonight with my friends. Very tasty! I added freshly squeezed lemon juice to the tahini sauce as I was whisking it, and it was delicious. Lovely! Thanks for sharing, Christina! Right? So good! Hope you love this one! I’ve made this at least 4 times since the recipe first appeared. Love love love it. I use fresh garlic and some lemon juice in the tahini sauce, and canned chickpeas, rinsed and then soaked in water for 30 minutes to reduce the sodium. The recipe is incredibly flavorful. 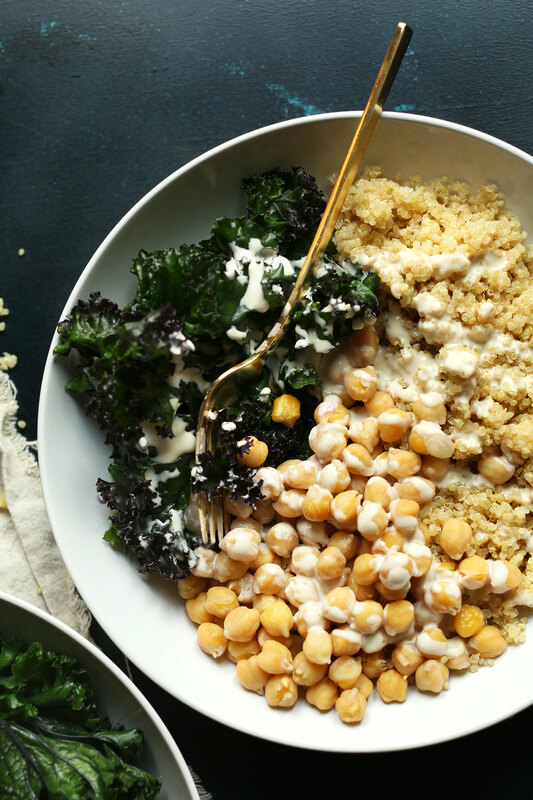 I’ve never been too big on kale, but with this tahini sauce drizzled on it I’m suddenly a fan. I’ve made the bowl with other veggies, too: beets, sliced tomatoes, green beans…it’s highly adaptable. Yay! So glad you like it, Leni! just wanted to ask – do you salt the chickpeas before cooking (step 2)? i learned not to salt pulses until after cooking, because salt will prolong the cooking process. any thoughts? If you’re worried about it prolonging the cooking process, season towards the end of their cook time! yes! sweet potatoes would be great with all these ingredients! Gorgeous photos, can’t wait to try this dish! Looking forward to making the Buddha bowl ! A recipe shouldn’t receive a poor rating because you assume your kids will think it looks boring…please rate the recipe if you’ve actually made it per the instructions so it’s actually helpful for others. You can add whatever you want to it to get your kids to eat it, but why not give the original recipe a try first to test the flavors (bc I bet they’re lovely, Dana knows her stuff), or just make something else altogether. I also can’t believe that the summer is almost over…but this quinoa dish looks delicious and so easy and simple to make! Yum! I love how simple and delicious this looks! Yuuuum I have a recipe similar to this coming out in September, I literally inhaled it it was so good. I just love the combination of this trio! Gorgeous! It’s like you read my mind. My bodybuilding trainer is trying to lower his cholesterol and has asked me to come up with easy, delicious meals that don’t include tofu. I came looking for your buddha bowl recipe (because why reinvent the wheel!) and this was on the first page. Easy? Check. Lots of protein? Check. Delicious? Oh you better believe check! I’m going to point him your way, thanks! Lovely! Hope you both give it a try! All my favorite food piled into one bowl?! Yes please! And I have all these things on hand (other than the kale, but that’s easy to swap out) so I’ll definitely be making this! Every single recipe of yours that we’ve tried has been AMAZING!!! I can’t wait to try this one. I just created 8 weeks of dinner plans and nearly all come from you! Thank you so much! Wondering if there’s a good substitute for kale in this recipe? We’re not huge fans. I’m thinking maybe bok choy or purple cabbage? Wow, thanks Beth! That’s amazing. If you aren’t into kale what about rainbow chard or spinach? I love kale in this recipe esepcially because it’s steamed so the flavor is less bitter and the texture is tender. Hope you give this recipe a try! Can you use canned chickpeas or is that blasphemy? Not blasphemy! I do it sometimes, too. However, with this recipe because it’s so basic the chickpeas cooked from scratch really make a difference in flavor, texture, and freshness. I find canned organic chickpeas to be both affordable and convenient and I prefer the softer texture to the soaked ones. I think it is just a personal preference. Just out of curiosity, what is considered a serving off cooked quinoa and chick peas? make a variation of a bowl everyday for lunch. Looking forward to trying your tahini sauce! Hmm, not sure! It might depend on your activity levels and body type. But I usually consider 1/2 to be one serving.